Painting your home is a straightforward, simple task: you get the paint on the walls, fence, deck, or furniture you desire evenly and smoothly and try not to get it anywhere else that matters. But just because it’s easy doesn’t mean it’s pleasant or quick. Using a simple brush or roller can certainly get the job done, but when considering time as a key factor, you might be better off putting money into a paint sprayer to handle the task dramatically faster. They can also eliminate unsightly brush strokes. Paint sprayers use either air pressure or pistons to pump paint through a nozzle and spray it as evenly as possible. Choosing an appropriate paint sprayer can save you time and money if you know what you’re looking for. 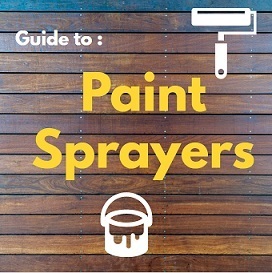 With the help of the men and women of PaintTalk I’ve put together this 3000 word article for more insight into how to choose the best paint sprayer. The amount of pressure applied to the paint separates the larger, professional paint sprayers from the more manageable ones for personal use. Remember that none of these do the painting for you. There is no magic tool that you load full of paint and then blast your walls or fence like a Super Soaker. Any of the following recommended models require practice to evenly apply the paint. A side-to-side motion where your strokes overlap can be tricky to master, so taking some time at first is necessary to get an even coat. One good way to gauge which sprayer will be best for you is to check the power. Most of these professional grade sprayers are measured in wattage and max out at about 1000 watts. The greater the power, the faster the job, but only to the point at which you can handle it. Imagine a sharp drop-off on the time curve when you’re spraying more paint than you can handle and wind up spending half the time with a brush trying to sop up the spill and overspray. Then again, if you don’t have enough power, then a thicker paint could quickly clog the nozzle. Speaking of nozzles, it is important to consider the nozzle width to match the job you need. Many sprayers come with a single nozzle and then have larger or smaller ones available. Again, the type of paint you’re choosing can affect this choice. Stains are thinner and don’t need a large nozzle, but heavy latexes would. Interior paints tend to be lighter than exterior, as well. Are you working outside on a huge wall or a fence? You’d better choose one that has a long hose. Do you envision having to move your sprayer a lot but you can’t easily lift large amounts of paint? You might want to find a spray system that has wheels. Is volume a factor? Piston-driven sprayers can be very loud—they wouldn’t be a great choice for close neighbors or a sleeping family member. As your read the recommendations below, be aware that a lot of these advertise themselves as HVLP, which stands for High Volume/Low Pressure. These are designed to move a lot of paint without spraying it all over the place, most importantly as particulate matter in the air. This system can handle paints of a variety of thicknesses with relative ease. The gun is easy to operate and clean so you can be ready to reuse it again without much hassle. With 25 feet of hose to reach exceptionally far and a bottom-fed quart cup, this HVLP provides one of the smoothest flows with minimal overspray. Many of its features are adjustable too, depending on the job and paint thickness. Unlike some competitors, you can purchase different caps, too, for dramatically thicker products including primers. The Fuji Semi-Pro 2 may break the bank at a whopping 425 USD, but you get a high quality, lasting product for that much money. As one of the leading brands in paint sprayers, Wagner’s Control Spray Max does a fantastic job and is cheaper than anything else on this list, nearly making the budget category at a price under 120 USD. But it’s by no means a cheaply made product, and is the greatest value of any sprayer on both of these lists. The Control Spray Max wins for reasons other than its price. With 20 feet of air hose, you have a lot of mobility. You can also adjust the spray width with a dial, switching from 1 inch if you have little spindles to paint, all the way up to 10 inches for cabinets and other larger projects. Further adjustments can be made to the air pressure, so if you’re using a lighter weight paint, it won’t just blast out in massive quantities. 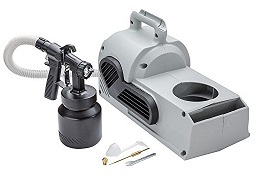 Other standout features include a double-filtered system to block particulates from clogging the gun, and a high quality quart-sized metal cup (with a 1.5 quart cup to spare). One small drawback of the system is that the nozzle can’t be changed. It’s fixed onto the gun that comes with the system, and thus doesn’t allow much flexibility if your paint suggests a different size. Also, the compressor and hose only work for Wagner, so you’ll need to be sure this is the sprayer and system for you. 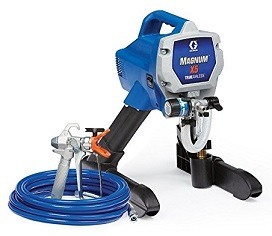 The Magnum X5 gets up to 3000 psi of pressure, spraying at .27 gallons per minute. That’s an awful lot of power. Graco makes a wide variety of paint sprayers, which is why the name is well known and why they’re on the list twice (see below). With that experience comes some very useful features, like a self-flushing operation—the Power Flush—to clean it after use. There is also a special setting for priming to help evenly cover before you’re ready to put on the final coat. There are some drawbacks to having that much power. You’re prone to overspray even with the adjustable features—so be prepared to tarp and mask everything. You also might be battling the hose to maintain control of the gun. Coming in at around 280 USD, this paint sprayer is durable and professional grade without being too far out of reach for some consumers. With another Graco product on this list, there had to be something significant to differentiate the two. How about being able to spray directly from either a 1- or 5-gallon paint can? With the Project Painter, you can hook the paint can right onto the sprayer and move them both around in tandem. 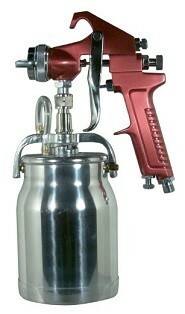 While most guns require a refill after their 1-quart cup is spent, you can work much longer with this sprayer. And no need for thinning with this much power. 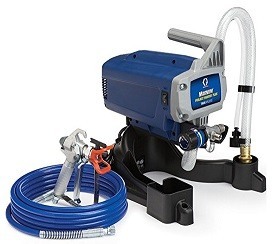 Like the other airless Graco models, this has Power Flush, comes with 25 feet of hose, and comes with a DVD to help you operate it properly. So why bother with the Magnum (listed above), especially since the Project Painter Plus will run only about 225 USD? It’s mostly about the power. The motor’s horse power is 25% lower (at 3/8 hp), and it sprays .24 gal/min instead of the Magnum’s .27. In Graco’s own language, the Project Painter Plus is for “DIY” while the Magnum X5 is for “Project” work, and can handle a larger annual gallon usage without too much wear and tear. Either of these Graco products would be a great choice but just for different amounts of usage. 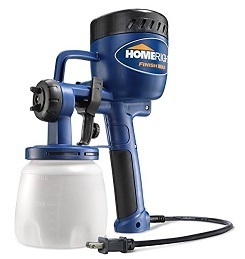 Another well-rounded HVLP spraygun, Rockler’s product is a solid choice that’s a little cheaper than many of the others on this list (except the Wagner) at about 150 USD. So what do you get for that price? There are a few points at which this one falters slightly. It’s a noisy sprayer, and you can’t adjust the air pressure. The hose is a little shorter at 15 feet, and you get two nozzle choices at .9 and 1.8 (and others are not available). 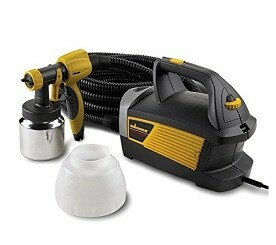 But you get a reliable and smooth spraygun that is easy to operate. More than the others above, a novice could handle the well-designed Rockler. The lower pressure makes it fantastic for its price to avoid bubbles on your top coat. That said, with that lower pressure, it’s not the best for all paint types. Still, a solid choice to round out the higher-end spray guns that won’t break the budget as much as some of the others. Quick note: although a lot of these are very inexpensive, you need to have your own air compressor. So you’re either saving a bunch of money if you already have one, or you’ll have to get one separately. Some of these are essentially airbrushes which are better suited for detailed artistic work. This sprayer combines both a very low price and a simple, easy-to-clean design to make the top of the budget list. Operating a siphon gun, you can adjust the width of the spray fan depending on the job you’re doing. Not a lot of frills here, but for only 30 USD, you’re getting a quality gun for very little investment that still manages to have some adjustments. The other guns on this list may do a little more, but not for this price. This very inexpensive sprayer can easily adjust the air pressure with a valve and it comes with a spanner and cleaning brush. When working with thinner paints like stains and interior latexes, it can be a great choice. The biggest drawback is that it doesn’t come with any filter and you’ll definitely want to use one. You will likely need to thin any primers or other thick paints when using this gun, so be sure to follow the manufacturer’s instructions for that thinning to prevent clogs (and possibly thin even more than they suggest). This budget sprayer has an adjustable spray pattern (vertical, horizontal, and circular), and works excellently with light materials like stains and sealers. It also comes with a 1.5 quart cup to handle some larger projects. It doesn’t work well with thicker paints, but if you’ve got a simple project indoor or outdoor, this could be a good budget choice at a little over 70 USD. The Campbell Hausfeld is very similar to the Neiko above but it can run even cheaper at only about 30 USD. At this point, you’re well under what it would cost to even rent one of the professional grade ones mentioned above. Like the Neiko, you need a filter and compressor already, but it can handle a wider range of paints than most sprayers could at this price. However, it’s a little bit difficult to use and would require some practice to get an even coat. It works well with lower pressure compressors, so you can avoid overspray and get a nice even coat. This goes to show that the cheapest choice is not always the worst. The HomeRight has a lot of adjustable features for a budget sprayer. You can change the shape of your spray—choosing vertical, horizontal, and circular to help get the best coat for what you’re working with. This makes it an excellent choice for smaller items like staining spindles or other finer pieces of furniture. This HVLP has a few drawbacks including a very short cord at only about 6 feet and a steeper learning curve to get a quality even coat, this could be a good choice for some and not for others. For a little over 60 USD, if you’re working on spindles or smaller furniture, this could be a good choice for you if you’re willing to practice. Speaking of particulate matter, all of these require thoughtful safety measures. Even if the sprayer is designed to minimize paint in the air, it will definitely still be there. Wearing a mask and eye-protection are crucial to keep the operator safe. Likewise, make sure you thoroughly tape and tarp everything you care about that isn’t the surface you’re painting. It may seem like a fine enough mist, but it will discolor or damage anything it falls on. Now that we’re ready, let’s look at the best options for paint sprayers. When you are done cleaning up, run a mixture of automotive anti freeze and water through the pump and gun. This will keep the insides lubricated and prevent rust. Experienced users would store their spray gun in a bucket of anti freeze mixture between jobs. A spray guns ability to spray latex well is primarily determined by the tip width and spray guns have their own set of tip widths they support. It’s better to have a proper tip than it is to thin your latex. You should use at least the 1.7mm or 2.5mm fluid tip for gravity feed guns, and a 1.3mm thru 2.5mm for pressure feed systems. You have to thin your latex for HVLP guns. Typically 5-10% for pressure feed and 10% for gravity. Add f﻿﻿loetr﻿﻿o﻿﻿l for better flow, it’s not a thinner, it’s a lubricant. 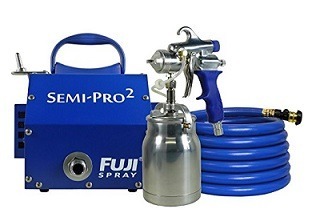 Much like a conventional paint sprayer uses a compressor to supply air a HVLP spray gun uses low pressure which might be worrisome if it weren’t for the high volume(HV) of air that is used to atomize and push the paint out rapidly. As a result we see a thick even coating of paint covering the targeted surface. It does this cost-efficently which for the user means less overall cost and a cleaner work environment. A word of caution a regulator is often required so the air pressure from a regular compressor matches the pressure of a HVLP spray gun. Another solution would be a turbine that is used to push the air out without a connected compressor. Much like their more common older brother low volume low pressure spray guns is the next step in trying to be as cost efficent as possible with your materials reducing waste. The transfer efficency is one of the best in the business. Electrostatic painting is the technique of using the electrical properties of atomized particles to repel each other as they coat the magnetized object. This is a great method for a full cover of paint for highly detailed objects that a regular wet spray or brush might not reach. But the downside is that this is not a viable solution for home use unless you also have an oven to bake your object in. This solution is better suited for businesses that regularly work on large or complicated pieces such as bike frames or car parts. Airless paint sprayers as the name suggests use high pressure instead of air to atomize the coating. This type of solution is commonly used by professional painters in heavy industries, coating and linings for things like chemical or marine tanks. It’s used due to the thick coating it produces which permeates into any nook and crannie which by extension limits the need for other coatings. Due to the high pressure nature of these spray guns caution is advised. These spray guns use a mixture of air and fluid pressure to atomize the coating. Due to the fluid pressure being provided by an airless pump it’s possible to coat with heavier materials than with a run of the mill airspray gun. Alternatively some electric airless sprayers are combined with a compressor to make them portable should the situation call for it. This kind of equipment is suitable for a more professional factory line setting where speed and reliable coating is required. Can be from anywhere .011 to 0.021 inches. Reversible – Easy to unclog the paint because you can turn it around and blow out the blockage. Note! Tips decay over time with use. So if you notice the quality of the spray decline it might be time to replace the tip. After choosing your tip. 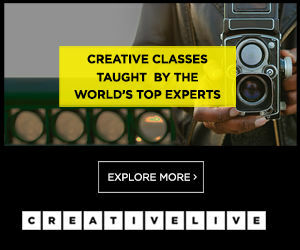 Choose the pattern width. Widths come anywhere between 6 to 14 inches wide. Much like common sense if you’re working on a smaller object or detail choose a smaller pattern width but if you’re working on a larger project (ceiling, wall) than get a pattern with a larger width. With the best paint sprayers quality correlates well with power. Power correlates with cost. Regardless of the equipment you use it’s highly recommended that you read the manual of the equipment you bought. Most problems occurre due to the inexperience of users and their unwillingness to read the manual or watch the dvd before handling the spray gun. This is particularly important with cheaper products since they’ll have less power to compensate misuse.